Unless you’ve been hiding in a cave or under a monument of General Nathan Bedford Forrest you probably know that there is a huge debate roiling our nation about the more than 700 monuments to the Confederate soldiers who fought against the United States in the Civil War. Some Americans think all Confederate monuments should be torn down, others want to erect new monuments to the Confederacy. What do you think? And what can you do about it? It’s your time to take part in this discussion by acting on your informed knowledge! Before we learn more about this, share your opinion - take our Confederate monuments survey. Let’s use the current controversy surrounding Confederate monuments as an opportunity to educate yourself, your community and take an informed action. And here's a great compendium of editorials on Confederate statues from the right, left, center, and from the past! Let’s learn a bit more about Confederate monuments before we do anything about it. 1. There are at least 1,503 symbols of the Confederacy in public spaces. The study identified 1,503 publicly sponsored symbols honoring Confederate leaders, soldiers or the Confederate States of America in general. These include monuments and statues; flags; holidays and other observances; and the names of schools, highways, parks, bridges, counties, cities, lakes, dams, roads, military bases, and other public works. Many of these are prominent displays in major cities; others, like the Stonewall Jackson Volunteer Fire and Rescue Department in Manassas, Virginia, are little known. 2. There are at least 109 public schools named after prominent Confederates, many with large African-American student populations. Schools named for Robert E. Lee are the most numerous (52), followed by Stonewall Jackson (15), Jefferson Davis (13), P.G.T. Beauregard (7), Nathan Bedford Forrest (7), & J.E.B. Stuart (5). The vast majority of these schools are in the states of the former Confederacy, though Robert E. Lee Elementary in East Wenatchee, Washington, and two schools in California (elementary schools named after Lee in Long Beach and San Diego) are interesting outliers. Of these 109 schools, 27 have student populations that are majority African-American, and 10 have African-American populations of over 90 percent. At least 39 of these schools were built or dedicated from 1950 to 1970, broadly encompassing the era of the modern civil rights movement. Fun fact: I taught at both Stonewall Jackson Middle School and Robert E. Lee High School (both in Texas). Jackson Middle was 99% non-white (in fact I only taught one White student there, and, true story, his name was "Whitey"), and Lee High School was 90% non-white, with over 1000 ESL students. 3. There are more than 700 Confederate monuments and statues on public property throughout the country, the vast majority in the South. The study identified 718 monuments. The majority (551) were dedicated or built prior to 1950. More than 45 were dedicated or rededicated during the civil rights movement, between the U.S. Supreme Court’s school desegregation decision in 1954 and the assassination of Dr. Martin Luther King Jr. in 1968. The survey counted 32 monuments and other symbols that were dedicated or rededicated in the years since 2000. Many of these are memorials to Confederate soldiers, typically inscribed with colorful language extolling their heroism and valor, or, sometimes, the details of particular battles or local units. Some go further, however, to glorify the Confederacy’s cause. For example, in Anderson County, South Carolina, a monument erected in 1902 reads, in part: “The world shall yet decide, in truth’s clear, far-off light, that the soldiers who wore the gray, and died with Lee, were in the right.” Three states stand out for having far more monuments than others: Virginia (96), Georgia (90), and North Carolina (90). But the other eight states that seceded from the Union have their fair share: Alabama (48), Arkansas (36), Florida (25), Louisiana (37), Mississippi (48), South Carolina (50), Tennessee (43), and Texas (66). These monuments are found in a total of 31 states and the District of Columbia. Outside of the seceding states, the states with the most are Kentucky (41) and Missouri (14), two states to which the Confederacy laid claim. Monuments are also found in states far from the Confederacy, including Arizona (2) and even Massachusetts (1), a stalwart of the Union during the Civil War. 4. There were two major periods in which the dedication of Confederate monuments and other symbols spiked — the first two decades of the 20th century and during the civil rights movement. Southerners began honoring the Confederacy with statues and other symbols almost immediately after the Civil War. The first Confederate Memorial Day, for example, was dreamed up by the wife of a Confederate soldier in 1866. In 1886 Jefferson Davis laid the cornerstone of the Confederate Memorial Monument in a prominent spot on the state Capitol grounds in Montgomery, Alabama. There has been a steady stream of dedications in the 150 years since that time. View and download a larger version of the timeline. Let’s start by learning about where Confederate monuments are. There are over 700 Confederate monuments in the US today! Use the Confederate Monuments map to locate a confederate monument in your community. Get local. 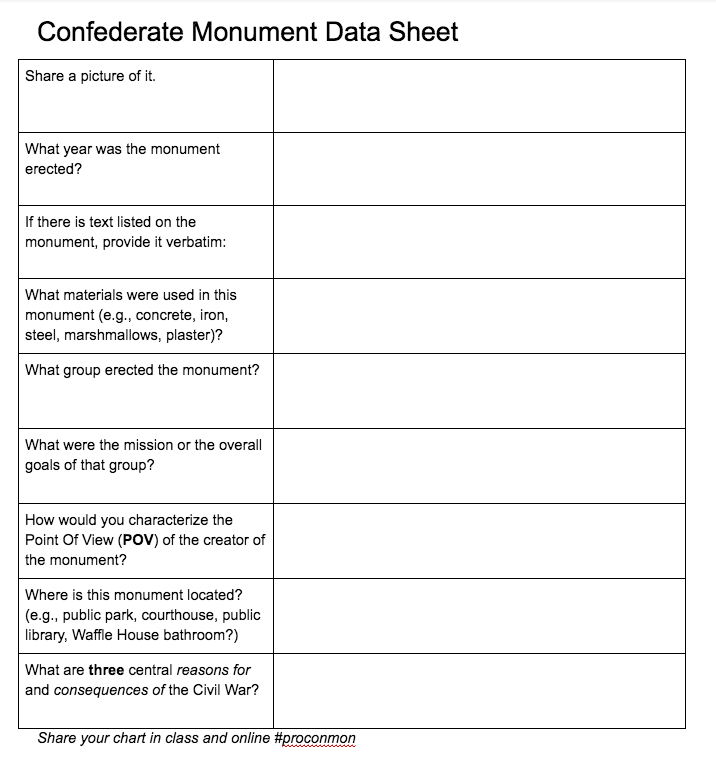 Fill in the Confederate Monument Data Sheet below about a Confederate monument in your community. If there are no monuments in your community then you must not live in the South (like I do), and you can just pick any monument from the map and database. Pro-tip: there are other people in the world and they don’t all think like you. 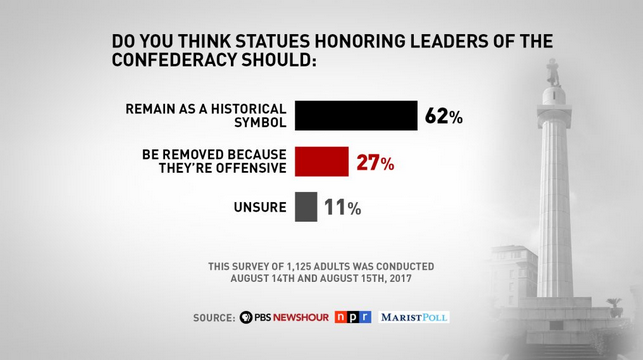 As you think about the following actual and hypothetical people, consider how each individual would probably feel about a Confederate monument or statue. To convey their feelings, list one adjective or mark a frowny (anti-monument) or happy (pro) face next to each person. We’re not done yet. Here’s some more questions for you to ponder. When were the first slave brought to the US? Why were humans used as slaves in the US? What were three major consequences of slavery? How much did the Civil War have to do with slavery? What do you imagine an Indian person would think of a statue or memorial commemorating their colonial British rulers? What do you imagine a Jew would think of a monument of memorial commemorating the Nazi generals leading the German Army in the Third Reich? What would you think of a statue commemorating George III, colonial ruler of the American colonies? Would your community likely erect a monument to a confederate leader today? Let’s say you support the idea of a monument to people who fought against the United States in the Civil War. Where do you think the most appropriate place for a Confederate monument would be in your community? What did you learn from the map of Confederate monuments? What did you learn from the timeline of Confederate monuments? Ask (in person or by sharing my Confederate monuments survey) 10 people to share their opinion about Confederate monuments. Share their responses with your class and online. Please try to survey a diverse (racially, religiously, economically - like the US) group of people and try to explain how demographics influenced your survey results. Write an adjective or phrase that describes how you feel about the Confederate statue on a large piece of paper and hold it as you stand in front of the statue. Share your photo and your explanation for your feelings with us. Position yourself near the Confederate monument for one hour. Give 10 individuals a piece of paper and a marker. Have them write their reaction to the Confederate monument on the piece of paper and take their portrait while they hold the paper in front of the monument. Write a letter to the editor of a local newspaper/new website explaining what you think about Confederate monuments in your community or across the nation. Start and sign a petition or write a letter to the local city council/county commissioners explaining what you think they should do about Confederate monuments in your community. Make a counter-monument. Imagine what a monument would look like to the victims of slavery. Create a textual or visual draft of a monument for these people. Share your draft or even better, create a monument and place it near the Confederate monument. Document this. Educate your community. Create a pop-up educational platform (digital, a tryptic, a flyer, a poster, a handout) about the Confederate monument and the history of Confederate monuments. Place your monument near your community’s Confederate monument. Document this. *These are tumultuous times. People have different and strongly held opinions about this topic. Your safety is important. If anyone is hostile, belligerent, or aggressive towards you or your work, do not engage with them. Now that you’ve learned about and acted on this issue, share your opinion - take our Confederate monuments survey.